Jason Byassee is Butler Professor of Homiletics and Biblical Hermeneutics at Vancouver School of Theology, a United Methodist minister, and the author of numerous books including Praise Seeking Understanding: Reading the Psalms with Augustine. We all know stories of folks walking away from faith. I find it much more interesting to ask why anyone stays. I heard one such story of a friend of a friend who stayed Christian only because of the incense. He had rejected all the ideas and practices, but the smell kept him coming back for reasons he could not explain and actually found laughable. The psalmist would not laugh. “Let my prayer be to you as incense,” David prayed (Psalm 141:2). This is of course, just a metaphor. But evangelicals of all people should know that nothing is just anything. Think of your visceral reaction when someone claims the Resurrection is just a metaphor. Ancient Israelites knew how to pray by lighting candles and watching the light glow and the smoke rise, and by smelling the incense. This is not just a later layer of tradition that Protestants shucked off. It is biblical. And in this man’s case, it was evangelical. It drew him to Jesus through the church. For five centuries Catholic and Protestant Christians have each defined themselves partly by not being the other. To belong to the Church of Rome was to be on the fast lane to the place where horned people carry three-pronged spears, Protestants thought; vice-versa from Rome’s perspective. At some point that stopped being true. Maybe it came from Vatican II bringing Catholic liturgy into the vernacular; from Mary placed on the side and Christ’s cross at the center of Catholic worship space; and from the personal heroism of John Paul II. This shift is epochal. We can think of ancient practices as ways to advance to higher spiritual realms, but that is gnostic, elitist nonsense. I would prefer these practices be narrated as learning from tradition something forgotten from Scripture. Evangelicals are Bible people first and foremost and should never apologize for that. Tradition can remind us of things forgotten or neglected, however. I learned anew how to pray from Trappist monks. They commit to poverty, chastity, and obedience (and claim obedience is the hardest). They chant Psalms seven times a day, as the psalmist says (119:164). They take this so literally they arrange working, sleeping, and eating to be in church seven times a day (eight if you count the Eucharist). This is no onerous duty; it is actually full freedom. I’ve never been around happier people. They taught me again to love the Bible. Evangelicals first taught me that. But we forget quickly. I asked a monk once which saints were buried under their altar. He immediately knew what I meant. Revelation 6:9–11 speaks of saints under the altar praying, patiently waiting for Christ’s kingdom and their vindication. So Catholic altars have the relics of saints under them. This monk couldn’t remember who! It hardly mattered. As we pray we join with the prayers of countless people we cannot see with our physical eyes. There are macabre versions of this relic practice that strike me as more pagan than Christian. But this monastery was simply taking the Bible more literally than perhaps the Bible is asking to be taken. That is no sin. I was at the monastery once on August 6, the traditional feast of the Transfiguration for Western Christians. It is also the day of the Hiroshima bombing that ended World War II but killed tens of thousands of civilians. A monk prayed that day for those “transfigured this day at Hiroshima.” And suddenly an image of unimaginable grace eclipsed an image of unspeakable horror. That’s the sort of creativity in prayer that comes from keeping a calendar and praying for the world for a living. I hope evangelicals keep learning from practices of more liturgical communities and vice-versa. For one day we will all be one. And maybe then the world will believe (John 17:21). Chris Armstrong is senior editor of Christian History and the author of Medieval Wisdom for Modern Christians and Patron Saints for Postmoderns. While I applaud the church’s retrieval of ancient practices, I find many Protestants are held back from a medieval retrieval by “black hole historiography”—the assumption that, sometime around Constantine, the church fell away entirely from truth, leaving the medieval period to struggle in spiritual darkness until the Reformation. This is particularly incongruous when we understand that Luther and Calvin were thoroughly medieval in many ways. Their favorite theologians included Augustine and Bernard of Clairvaux, and they drew deeply on medieval mysticism, the medieval concern for truth, and much else of that era. Though recent works have been rehabilitating the first four to six centuries of the church, the medieval period has been left in the black hole—its riches largely inaccessible to modern Protestants. And even when accessed, the appropriation is often limited to individual practice and marked by a consumerist tone (pick one “spiritual discipline” from column A, one from column B, and enjoy them in the privacy of your prayer closet or small group). I believe that the medieval church is our next frontier. It certainly contains its share of “land mines” to identify and skirt. But medieval faith also offers, for pilgrims lost in modern mazes, well-marked pathways “onward and upward” to long-lost vistas of spiritual vitality. What will the modern pilgrim see? First, those who still assume that “tradition” must inherently contradict Scripture will discover how medieval thinkers revered tradition in harmony with Scripture. Second, those who sense that our world reflects God’s glory will find in medieval scholasticism’s theologically informed, intellectually voracious, and disciplined pursuit of the liberal arts the original vision of the university—now lost to secularization. They can thereby recover reason, not as an independent human power, but rather as God’s highest earthly gift to humanity. Third, those misled by “situation ethics” devoid of any standard or consensus will rejoice in medieval traditions that ground moral action in precise, acute, and biblically faithful understandings of virtue and vice. Fourth, those mired in the modern dismissal of the material world as spiritually irrelevant, or the modern materialism that makes idols of material goods, will rediscover older sacramental ways that find the Creator everywhere in Creation. Fifth, those whose walk with God has begun to feel routine and lifeless will draw new life from a devotional tradition that dwelt lovingly both in the passion of the Song of Songs and in the compassion of Christ on the cross. Our devotions can once again engage our imaginations and our whole hearts, as we find new sweetness in the old stories of Scripture. Sixth, those of us thwarted again and again in our walk with God by the sheer cussedness of fallen desires and habits will find in medieval ascetic and monastic traditions a way of living faithfully, shared too by such lay movements as the Brothers and Sisters of the Common Life (see CH issue #127). Finally, if our faith has begun to feel distant from our daily lives, we will discover medieval Christians’ wonder at the Incarnation: God walking with us in our homes, neighborhoods, workplaces, and civic spaces. Greg Peters is an associate professor in the Torrey Honors Institute at Biola University and ordained in the Anglican tradition. His books include The Story of Monasticism: Retrieving an Ancient Tradition for Contemporary Spirituality and Reforming the Monastery: Protestant Theologies of the Religious Life. 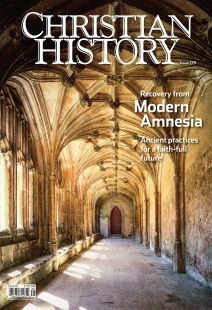 As is obvious from this issue of Christian History, a movement is ongoing to recover the theology and practices of ancient forms of Christianity. The first four centuries are often privileged and sometimes even misappropriated by a misunderstanding that something pure and pristine about the early church makes it especially important to recover. What if we went further forward? Without a doubt the frequent celebration of the Mass centered the worship life of medieval Christians. Many other spiritual practices from the medieval church could be commended to believers today, but none should displace the importance given to the Eucharist. In the words of historian Eamon Duffy, “The liturgy lay at the heart of medieval religion, and the Mass lay at the heart of the liturgy.” For Christians in the Middle Ages, the Mass was the sacred action that reenacted Jesus Christ’s self-giving on the hill of Calvary. Nonetheless by the high and late Middle Ages, it was uncommon for believers to partake of the Eucharist. Most only did so at High Mass on Easter Sunday, though everyone sought to receive final Communion, the so-called viaticum (food for the way), on their deathbeds. Instead the focal point and whole reason to attend a Mass became to see the elevated Host. By the end of the twelfth century, the priest at the altar had begun to elevate the host for all to see just after the consecration (the words of institution—“This is my body”). Most modern Protestant Christians would reject this theology, including infrequent reception and the practice of only gazing at the Host. But we could learn from the Middle Ages to celebrate the Holy Eucharist frequently. It unites a congregation around one central ritual act that itself is meant to bring unity to the people of God. Holy Communion done well involves both the ordained leadership of the parish and the gathered congregation. In my Anglican tradition, the priest says much of the Eucharistic service. Yet at the end of the consecration, the congregation adds their own “Amen,” affirming the action done on their behalf and showing that they too are acting out of the biblical doctrine of the priesthood of all believers. The bread and the wine are not just for each person but for the church. George Herbert writes of doing all things for Christ—and the discouragement when doing all things seems to not be enough.